Is the housing recovery here? Is it good news? Well, it depends on who you are and where you are. If you’re a REALTOR you’ll raise your right hand and swear we’re on an upward path. If you’re a consumer you may be more cautious. If you’re a mortgage lender you may have missed the memo. If you live in New Jersey the news will be different (and better) from those of you who live in other parts of the country. The news will be also different from town to town within New Jersey as well. Robert J. Shiller, who helped devise the S.&P./Case-Shiller 20-City Index contends that in our society both consumers and lenders have become less speculative toward housing and have become more wary and regulated. * This trend would mitigate against another spectacular run up in prices like we saw before the correction in the market. Indeed, no one is predicting another boom in prices or volume going forward. After all, the 10 year upswing we experienced from 1996 to 2006 is generally regarded as an anomaly, both in duration and prices. While consumer confidence is growing, unemployment is only falling by tiny increments. The economy is not generating the 200,000 jobs per quarter needed to fuel an all-out recovery and the decreased jobless rate also reflects people who have stopped looking for work. The economy is growing but, in fact, did contract in the last quarter of 2012 due to a sharp reduction in government spending. The politicians and reactionary elements calling for deep government spending cuts should take note. The Federal Reserve has its foot on the gas, trying to stimulate the economy, mainly through “asset acquisition” – the buying of government bonds. This is the main instrument the Fed has in guiding the economy – the infusion or retraction of credit. The net result of the Fed’s current policies is the suppression of interest rates in mortgages, etc. So, if you’re a consumer that’s great news with 30 year fixed rates in the 3-4% range. But you’d better be a model citizen and be prepared to jump through a gauntlet of hoops to get your mortgage. since underwriting standards have become more strict. I’m not trying to discourage anyone. I think it’s a great time to buy, and, if positive trends continue, it may be a less great time in the future. The point is, signs are mixed as far as the overall market is concerned and overall trends are even harder to predict given the many different markets we have nationwide. The raw numbers of sold and under contract units, prices, and housing starts all point to improvement and most pundits are counting on these trends continuing and accelerating in the future. The problem with the future is it’s not here yet and usually defies our meager efforts to predict or control it. The future is also subject to so many forces – inflation (currently under control), energy hiccups, seasonal trends, weather related disasters, government actions (including Federal Reserve policy), possible government defaults, deficit increases and efforts to reduce it, foreign financial crises, and, of course, the main driver of any market: the psychology of the buyer based on perceptions, real and imagined. 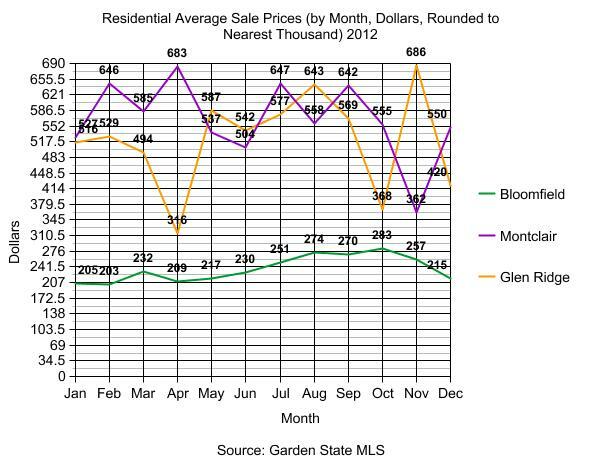 In my market area in Essex County, NJ, prices are flat year over year in the last two years with some small improvements and some small losses. Statewide New Jersey trends are equally hard to get a handle on since the state has over 500 municipalities, all of which are different markets. I track the trends in the towns of my market area month by month and graph them at the end of the year. In 2012 the graphs reflect the predictions for that year – improvement. Improvement, however, does not imply the end of what we’re improving from. 2012 was, by all accounts a transitional year where free-fall ceased and small improvement began. There are, however, many flat lines on the graphs in number of units and prices which shows an end to the bad news replaced by a holding pattern in anticipation of some future good news. You’ll see from the graph below that, seasonal fluctuations in price notwithstanding, where prices ended in 2012 was not that far from where they began at the beginning of the year. Bloomfield’s graph is particularly striking, showing a flat line for prices. While the Otteau Valuation Group** reports continued bullish news, signs of sustained improvement in the New Jersey market are mixed with falling inventory trends and larger numbers of contracts competing with pretty flat prices. 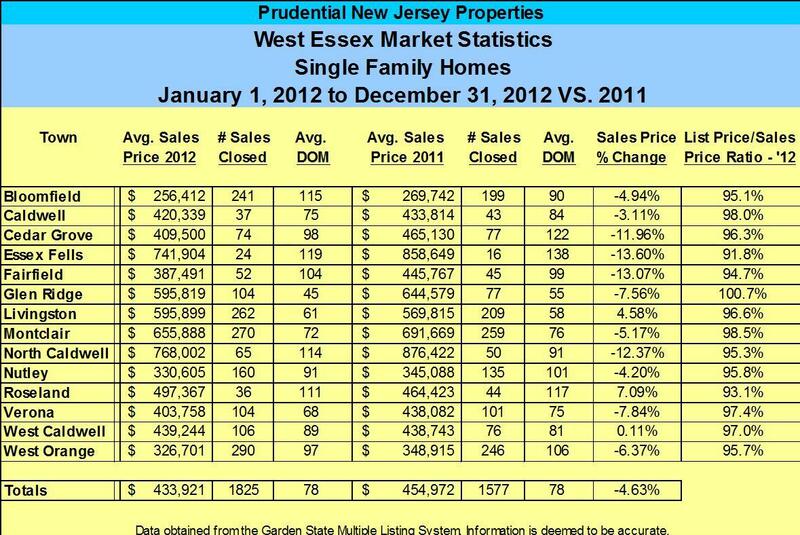 The following stats show how Essex County performed in 2012 vs. 2011. So what’s the overall conclusion to be reached? Again, it depends on where you are in the market – buyer, seller, REALTOR. Are the grim times over? Probably, but that’s most relevant for those of us who work in the industry and depend on its health. For everyone else the quality of the news is dependent on what you want from the housing market. Shiller recommends you not worry about home prices and encourages you to act if you have reason to be in the real estate market. Good advice.